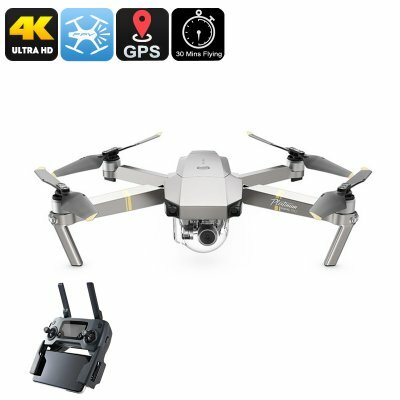 Successfully Added DJI Mavic Pro Mini Platinum Drone - 30 Minutes Flight Time, 65km/h, 15KM Range, GPS, 4K Camera, Different Flight Modes, App to your Shopping Cart. The DJI Mavic Pro Mini Platinum is one of the fastest, longest lasting, and quietest commercial drones currently available. With their latest RC drone, DJI has once again stunned the electronics industry. This remarkable Quad-Copter is capable of reaching unbelievable in-flight speeds and comes with an increased flight time thanks to its upgraded motor and battery. If you’re looking for a high-end video drone, the DJI Mavic Pro Mini Platinum is the way to go. With its abundance of in-flight features, high-end specs, and 4K camera – this quad-copter has it all. With its state of the art motor, this DJI drone allows you cruise through the skies at speeds up to 65KM/h. The drone itself is extremely compact and lightweight. Therefore, it brings along great maneuverability. A powerful 2970mAh battery is in place that delivers up to 30 minutes of uninterrupted flight time. It furthermore supports a stunning 15KM range. Thanks to this, you’ll truly be treated to unlimited possibilities while flying around and discovering your surroundings. This latest video drone comes packed with a professional-grade 4K camera. With its 3-axis gimbal, it lets you look around and snap great pictures and video from any angle. The camera itself comes equipped with a 1/2.3-Inch CMOS sensor that lets you capture Ultra-HD video as well as 12MP pictures. With different shooting modes and SD card recording, this video drone is guaranteed to meet all your photography demands. The DJI Mavic Pro Mini Platinum drone supports Dual-Band WiFi. It allows you to easily pair your Quad-Copter to your smartphone or FPV glasses. Treating you to HD live footage, it will truly enhance your in-flight experience. Your drone furthermore supports an abundance of in-flight modes. This makes the device easy to control and fly for both advanced and beginning drone pilots out there. No matter your demands, this DJI drone will meet them at ease. The DJI Mavic Pro Mini Platinum Drone comes with a 12 months warranty, brought to you by the leader in electronic devices as well as wholesale Quad-Copters..